Proteins naturally present in living organisms stimulate or permit certain molecular transformations. In oenology, enzymes are catalysts in both the rinsing processes and the extraction of coloring or aromatic compounds. Essedielle enzymes are a reliable and technological partner with high purity and activity. A complete range of ADY yeast (dry yeast), a useful tool in modern wine-making. The strains are selected to offer a rich selection to the winemaker and to track a technologically more suitable way for the pursued objectives, ensuring the highest performance. It is essential to get high quality results, ensuring proper nutrition at all stages of fermentation. Essedielle provides to oenologist the food and fermentation activator designed to meet the metabolic needs of the yeast, thus guaranteeing a fermentation without imperfections, maximizing the production of flavors. 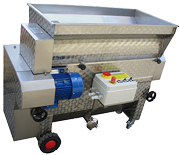 Jollty's range of sweepers - the Enoitalia Jollty range - is designed for professional use and includes machines adapted to each type of manufacturer. Pneumatic, hydraulic and continuous presses from Enoitalia and Puleo are ideal solutions for processing both freshly crushed and fermented grapes. 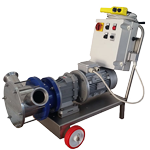 Enoitalia and Rover self-priming pumps and variable speed pumps, depending on the needs, provide the best solution in the wine production flow through reliability and ease of use. Filters have the role of clearing the residue from wine and are used for the mechanical clarification of must of wine in order to prepare for fermentation, clearing the residue and microorganisms, that could influence the wine quality even after the bottling process. Consumables for filters, are used for the operation of filtering microorganisms that could harm the process of making high quality wine. Stainless steel tanks are used for storage and transportation of the wine. The main plus is being sealed which keeps the liquid from having contact with air, thus making the process of wine manufacturing run normally. Bentonite makes wine imperfections separate from the liquid and sediment on the bottom of the tank. After introducing it in the wine tank, the liquid becomes clear. Coal is used in order to eliminate unwanted odours. These substances are used in order to maintain the organoleptic qualities of the wine, color stability, and a particular character, boosting taste, flavour and color, depending on the breed and the final aim of the producer. In order to complete every step in the process of winemaking,winemakers need information that define this road,throughout different steps of the process. An oenological laboratory, having dimensions tailored for the needs, that supplies this data is an important component of the technological flow.